It was 'winner takes all' and the look on the faces of the players said as much. Blaring down the touchline, with the ball hardly in control was a slight, floppy haired individual. The name on the back of the orange hued jersey proclaimed him to be 'Messi.' He advanced cutting through the opposition team like a knife through butter. He feinted right, feinted left and then before he could send the ball through, he tumbled, flat on his back. Sensing the insecurity in the opposition defence, a tall lanky Scandanavian whose jersey said he was Henrik 'Larsson' bore down on goal, not unlike his Swedish striking namesake. He failed to connect with the ball however, falling to the ground as the ball edged away beyond the touchline. There was a moment of silence and then the laughter cut through. From both sides. That was fun, said Sanjay 'Messi' Prakash, CEO of HSBC. Henrik 'Larsson' Baggas, Director of Ericsson agreed; this was fun indeed. The two were turning out for the Bengal Royals against the Dhaka Warriors in this specially organised CEO's match as part of the 6th edition of the Ascent Corporate 5-a-side Soccer Cup. But this humorous match played in a light-hearted atmosphere was a pleasant distraction from a more serious business; the annual corporate football World Cup, for lack of a better term, which was battled out between 48 corporate houses across the country. It is hard to argue with Quddus, whose brainchild started small in 2006 but has now picked up so much interest that they had to cull some teams from the final reckoning. The rules of 5-a-side soccer apply to the T and there are some additional strict rules in place to ensure that the tournament is played in the best of spirit. Keeping it amateur is a big task and the rules state that players have to be over 21 years of age with six months experience in the company. No current professionals are allowed to play and this ensures that the tournament remains fun, competitive and spirited. The idea for holding an event of this magnitude came to Quddus in 2005 during a trip to Kolkata where on the fields of the Calcutta Cricket and Football Club (CC & FC), the Kolkata Merchants Cup was being staged. The Merchants Cup is about 25 years old and has about 72 top teams in West Bengal Chamber of Commerce and Industry playing every year. Quddus felt that this needed to be replicated in Dhaka as there was no platform or event which allowed corporate professionals to brand their companies and have fun playing a sport that everyone knows how to play. 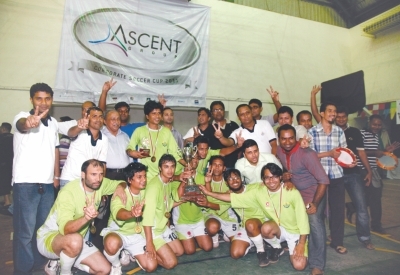 This year IIDFC became the champion of the Ascent Corporate 5-a-side Soccer Cup. The first Corporate 5-A-Side Soccer tournament was held in late June 2006 after a quick meeting with the late Imran Rahman, the Managing Director of BRAC Bank. Imran Rahman saw the potential of the event and immediately gave his consent to start with BRAC Bank as the title sponsor. The ISD Indoor gymnasium at their Bashundhara campus was the venue as 24 teams participated. In 2007, the participation grew to 30 teams. In 2008, Maher Murshed, Managing Director of Ascent Group stepped in and took over the title sponsorship and Ascent has been the title sponsor ever since. The format is simple. This year with 48 teams, 16 groups were formed with three teams per group. The teams went through a league (Friday and Saturday) each playing three games and then onto the knockouts before the pre-quarterfinals. 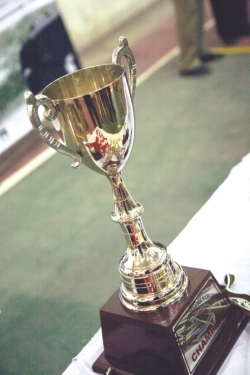 In order for all teams to have a great time, the organisers also arrange three trophies. The Cup, the Plate and the Bowl; this means each team has something to look forward to. The top team of each group play for the Cup, the second in the group plays for the Plate and the third in the group goes to the Bowl. Each category has a Champion and a runner-up. So it is all about playing and not losing! Games are almost always partaken with a seriousness missing at work. Thankfully the CEO's, for once, seem to indulge in the greater interest of corporate spirit. But over the years this tournament has developed a certain hierarchy with Beximco Pharma developing quite the knack of running away with the big prize. This year though, the hegemony was finally broken as a fiery force by the name of Gemcon vanquished the serial champions in the semi-finals. But if you thought that it means an easy run to the final, you are sure to be disappointed. Showing that there were no easy games at this level, Gemcon collapsed in the final, losing a thrilling encounter with IIDFC who emerged as the champions of the meet and etched a new name in the Ascent Soccer Cup. The tournament provides a great chance for intra and inter team bonding, improving relationships across the board. What is good for the employees is that the bosses seem to be encouraging this attitude. The future looks bright for this annual bonanza. Ascent is looking for ways to double the size of the tournament next year by using both of their campuses, Uttara and Mirpur. Playing the games simultaneously in both campuses will allow Quddus's Excalibur Entertainment to stretch the team participation to 72, the size that Kolkata Merchants Cup has now reached after 25 years. Excalibur is also mooting plans to introduce a corporate Olympiad where companies field a team for swimming, golf, table tennis and tennis. And what of the most popular game in the country? Cricket Sixers are very much on the cards as well. With all this whetting of appetites, most cannot wait for next year.